Many newborns will appear to have minor head injuries after their delivery. Superficial bruising and a little swelling are common, and largely unavoidable, complications of passing through the birth canal. In most children, these mild results of birth trauma will clear up soon after delivery. But in other cases, babies suffer truly serious physical harm during labor or delivery, sustaining head and brain damage that can have life-long consequences. Thankfully, traumatic blunt-force brain injuries are relatively uncommon among infants – but when these serious injuries have been sustained, the cause is often medical malpractice. Difficult labors carry the highest risk of physical brain trauma. During a prolonged labor, an infant’s head can repeatedly crash into the mother’s pelvis. That alone puts a child at risk of suffering brain injuries. But compounded by a negligent physician, who may think twisting and pulling on the child’s head is the solution, a difficult labor can become truly disastrous. In some cases, continuing labor isn’t even the right option. When doctors notice the signs of fetal distress, usually the result of fetal heart abnormalities, an emergency C-section is often (but not always) the appropriate intervention. Choosing to delay this potentially-lifesaving operation, and continuing with a vaginal birth, may constitute medical negligence under certain circumstances. In some deliveries, doctors choose to make use of birth-assisting devices, like vacuum extractors and forceps, in an effort to physically pull a child through the birth canal. These are delicate tools, ones that can both help and harm. In the hands of less-than-careful practitioners, forceps can become the agent of serious birth trauma. Breech deliveries may be a particular risk, according to Icelandic professor of obstetrics Reynir Geirsson. As Geirsson notes in his paper “Birth Trauma and Brain Damage,” newborns who are delivered in a breech position are more likely to develop syndromes related to brain damage during their lives. While the causes of brain damage are various, Geirsson believes physical trauma often plays a role. Breech babies, along with children who are large for their gestational age, may be more likely to suffer traumatic brain injuries during the delivery process. Intrauterine growth restriction, likely due to a restriction in oxygen and nutrients in utero, has also been linked to an increased incidence of neonatal brain trauma. Multiple pregnancies, like twins and triplets, are also of concern, as are babies delivered preterm. The symptoms of a brain injury can also change – depending on the causes and severity of the damage. Just as the brain is a complex organ, which can react to insult or injury in a variety of ways, the specific causes of brain damage can lead to extremely different symptoms, although some of these signs will only be seen on diagnostic tests. In many cases, the immediate effects of brain damage will be clear, apparent to both parents and physicians in the hospital. Unconsciousness is the most obvious sign that something has gone seriously wrong. Doctors sometimes rely on a test called the Glasgow Coma Scale to determine the severity of traumatic brain injuries. While the test wasn’t designed for newborn babies, particularly low scores on the Glasgow Scale may warrant an MRI or CT scan to analyze the extent of brain trauma in infants. Some symptoms are related more to an infant’s behavior, and may be harder to interpret in the delivery room. Some children who have suffered brain damage have trouble sleeping, while others have difficulty feeding, appear lethargic or are abnormally irritable. What Does A Brain Injury Look Like After Birth? The brain is an intensely delicate organ, and not every injury will make itself known immediately. In many instances, the brain must develop further before the signs of birth trauma become clear. Some families will only learn that their child sustained trauma after bringing a newborn home, and some effects will only become visible months into a child’s development. While many of these potential signs are cause for concern, the true effects of a child’s traumatic delivery aren’t likely to appear overnight. Some parents only recognize the possibility of brain damage after their child has missed one or two developmental milestones, skills like taking a first step or smiling for the first time. While every child will develop differently, there’s a normal timeline that researchers use to gauge cognitive and physical development. When children lag behind in these developmental benchmarks, it may be a sign that infants have a developmental delay. To find a comprehensive list of developmental milestones, broken down by a child’s age, visit the Child Mind Institute. Be sure to speak with your child’s doctor if you have concerns about their development. Intracranial hemorrhage is a general term for any type of bleeding inside the skull or brain. 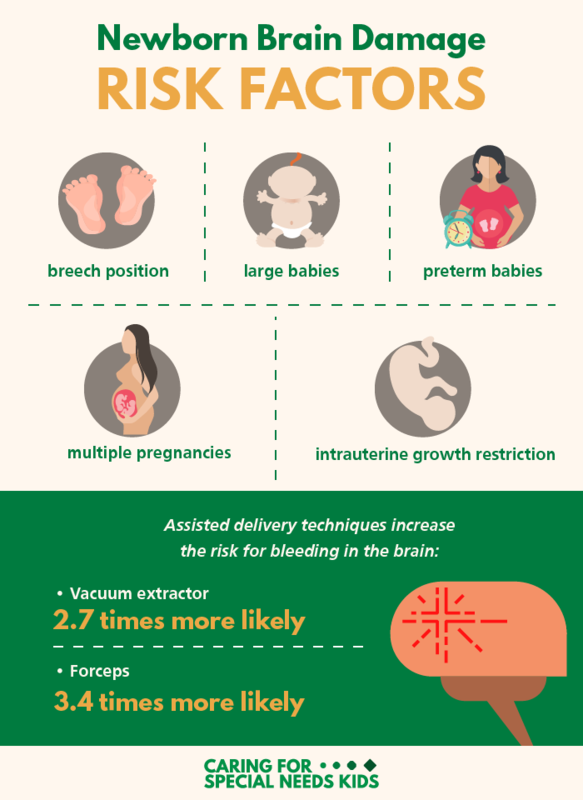 Years of medical research, both case reports and epidemiological studies, have found that babies who live through traumatic deliveries are at an increased risk for these potentially-severe brain bleeds. Doctors have linked intracranial hemorrhage to the use of forceps and vacuum extraction, as well as prolonged labors. In fact, babies delivered with the use of vacuum extractors may be up to 2.2 times more likely to experience an intracranial hemorrhage, doctors at Yale University School of Medicine report. Forceps appear to carry an even greater risk, according to researchers at the University of California, Davis, who observed a link between the assisted delivery tool and a 3.4 times greater risk for brain bleeding. Intracranial hemorrhages also seem to be more common in babies delivered via cesarean section. Noticing the effects of intracranial hemorrhage shortly after birth can be difficult. Babies aren’t able to communicate the condition’s classic symptoms, like dizziness, speech difficulties or alterations in visual perception. Diagnostic tests, like MRI or CT scans, are the traditional way to diagnose intracranial hemorrhage, allowing doctors to pinpoint the blood vessel that has burst and begin assessing which parts of the brain are being affected by the bleed. In severe cases, surgical intervention is required to close the hemorrhaging vessel and prevent the widespread death of brain cells. While some infants will recover fully after experiencing a brain bleed, the birth complication can also lead to brain damage – as brain cells are starved of blood and oxygen. To compound the problem, brain bleeds impair the ability of nerve cells to communicate with one another. At the earliest stages of brain development, such insults can lead to long-term cognitive impairments, as well as neuro-muscular disorders like cerebral palsy. Medical negligence is a serious, and all-too-common, cause of infant brain injuries. In many cases, children suffer brain trauma during labor or delivery unnecessarily – as the result of medical mistakes, errors in judgment or plain incompetence. But no family should have to go through the long process of recovery alone. If your child was diagnosed with a brain injury, our birth trauma malpractice attorneys can help.